In food processor bowl with metal blade, combine beans, oats, mushrooms, onion, carrot, bell pepper, garlic, ketchup and salt; process with on/off pulses until coarsely chopped. DO NOT PUREE. Shape mixture into 4 patties, 1/2 inch thick. Spray broiler pan with nonstick cooking spray. Place patties on sprayed pan. Broil 4 to 6 inches from heat for 10 to 12 minutes or until patties are thoroughly heated, turning once. 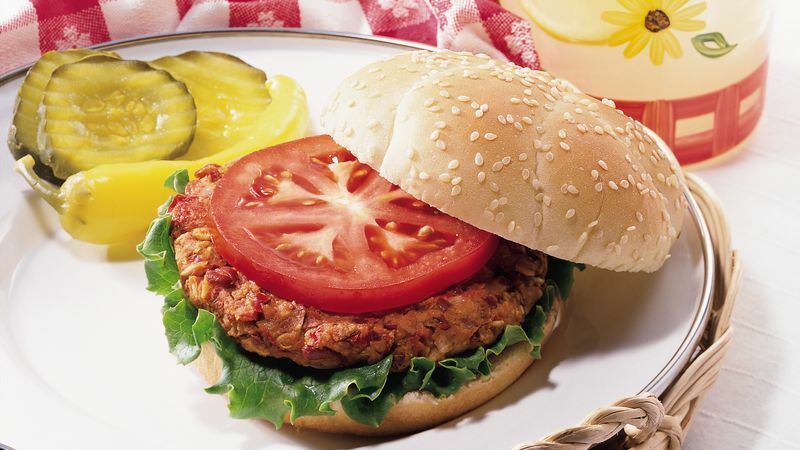 Place lettuce, tomato slices and patties on bottom halves of buns. If desired, top with ketchup or mustard. Cover with top halves of buns.